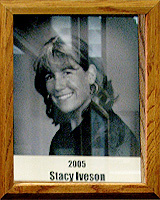 A graduate of Catalina High School (1981-1985) Stacy played volleyball; track; and baseball. During her tenure, she was on the All-City Team for Volleyball and softball; All-State softball; and volleyball state champions in 1983. She earned a BA in Elementary Education from the University of Arizona and a Master’s in Education Leadership from Northern Arizona University. While at the UA (1985-1990), she played softball and was the All Pac-10 Conference Catcher. In 1991, she began her coaching career at Salpointe Catholic High School, until 1994. In 1993, her team won the state title of STATE CHAMPIONS and she was named Coach of the Year. From 1994-2001, she was an Assistant Coach at the University of Arizona, under Olympic Coach and PCSHF Coach Mike Candrea. Her teams won NATIONAL CHAMPIONSHIPS in 1996, 1997, and 2001. In 2001, she left the UA to become Head Coach at Pima Community College. By 2004, she won her first National Championship with the Pima girls and she was named the 2004 Coach of the Year. In 2005, she was named Manager if the Arizona Heat, a professional Women’s Pro Fastpitch. She was able to do this during the summer months, when she would not be coaching her Pima College girls. In June 2005, the Heat played in front of more than 18,000 fans of girl’s softball, when Tucson favorite, and fellow UA Alumnus Jennie Finch came to town with the Chicago pro team. Stacy is active in the community, volunteering at teaching clinics; for Bobby Sox, Little League, and Junior/Senior High Schools, she has been chosen as a member of the 2008 USA Olympic Coaching Pool.